Well, I should be putting up my Day 4 of my Hokkaido trip travelogue, but I have to say, travelogues is a b*tch. Anyway, it's going to be up real soon, so do stay tune! Meanwhile, let's look at some healthy sweet treats! Craving for some chocolatey sweetness but not the ridiculous amount of fats or calories? Let me share with you my trick - APPLESAUCE! Yes, you can replace butter with just applesauce (doesn't work for every kind of baked goods though) and get equally yummy baked goods at just a fraction of the calories! So let's get over the ingredients so we can get started. You should add more if you're following my level of sweetness for the muffin batter. Otherwise, increase sweetness of the batter (100g sugar and 80ml honey) and add less of the chocolate chips or skip it totally. This is pretty much a one bowl recipe, or two, if you do not wish to sift your dry ingredients. Because cocoa powder is always quite lumpy, you would really have to sift out the lumps OR give it a good whisk in a bowl before adding it into the rest of the ingredients for your batter to mix well. So yeah, 1 bowl with sifting, or no sifting with two bowls, take your pick. 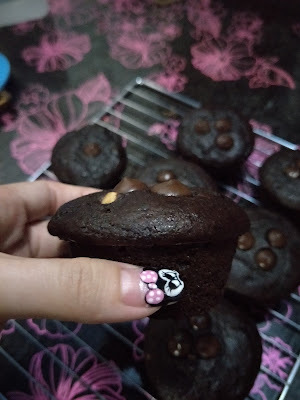 Anyhow, add all of your wet ingredients into a bowl and mix until well combined, before sifting/adding in the dry ingredients and fold until you do not see huge lumps of flours (but not yet fully mixed) before adding in the chocolate chips and folding until JUST combined. You DO NOT want to over-mix your batter. Then, distribute the batter equally into 12 muffin cups/tins and make sure they're UNLINED but coated with non-stick cooking spray or some oil. This is how you get your muffins to "climb" up as they bake and give you the cutesy muffin top. Otherwise you'll just end up with cupcakes, and that's no fun. Another important factor to make sure you get the muffin top, is the baking temperature. First, bake your muffins at about 220 degree Celsius for about 5 minutes (and you start seeing your muffin top forming) before lowering the oven temperature back to 190 degree celsius and baking for another 15 minutes or so or until a toothpick inserted comes out clean. You would probably want to bake your muffins using such tins instead of baking them in standalone silicon cups (like in the background) as not only those baked in silicon cups do not "climb" as high, the muffin top also OVERFLOWED as they formed, giving me some really ugly muffins. 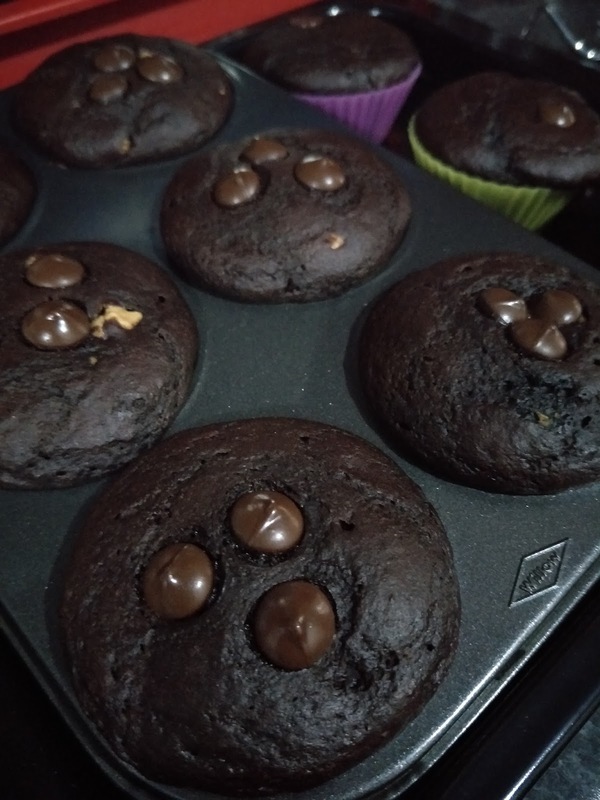 With 90g of the chocolate chips, 1 muffin will set you back by just 110 kcals and if you add more stevia and honey and omit the chocolate chips altogether, it would be just 82 kcals! Where else to find such a diet-friendly treat? And do note that this is a diet-friendly treat, there is absolutely NO butter in this recipe and while applesauce (and greek yoghurt) can help to give you soft and moist muffins, they cannot give you the buttery, rich fragrance of a standard bakery muffin. So, try to manage your expectations alright? It's so low in calories! What else can you wish for, right?